It was discovered recently that Apple’s A6 processor may actually be Apple’s first custom designed CPU; instead of taking advantage of the new ARM A15 architecture like originally believed. 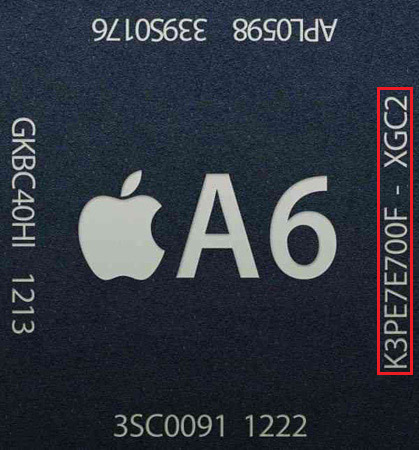 Today we have even received word on some more information on the iPhone 5′s actual hardware specs relating to RAM. Breaking down the part number, “K3P” points to a dual-channel LPDDR2 package with 32-bit channels, while the “E7E7″ designation denotes the 512MB density of each DRAM die, which comes out to a totalof 1GB of RAM. Finally, the “C2″ yields the part’s 1066MHz cycle time/data rate. What all this technical talk means to you is that you can expect Apple’s A6 chip to give the iPhone 5 a 33% boost in peak memory bandwidth compared to the iPhone 4S. The Android VS Apple debate is one that I do not think will ever end. Each platform has its own pros and cons and in the end comes down to personal preference. Although the debate may never be settled there are always interesting reports that tend to tip the scales in favour for a specific platform. 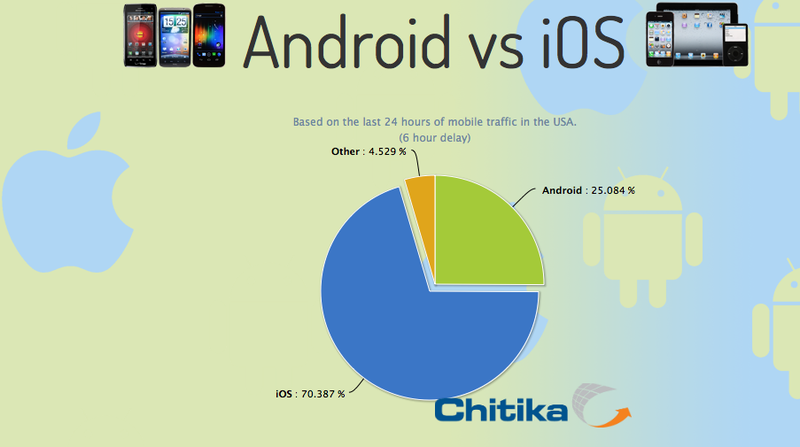 TechCrunch reported today that Chitika has noted within the last 24 hours the iPhone, iPod Touch and iPad have accounted for just under 68 percent of all (mobile) usage on its network. Androiddevices on the other hand have only accounted for about 28 percent of the total traffic, leaving all other platforms (Windows Phone, BlackBerry, etc.) responsible for a mere 5 percent of the total activity. You can actually see the statistics live for yourself at your convenience with a brand new tool from Chitika that refreshes itself every 24 hours, allowing you to see the mobile traffic dominance on Chitika’s ad network. So does this prove that iOS is better than Android? Not at all. These statistics are however, very interesting if you are in the world of mobile advertising or anything related to mobile content in general. And additionally these stats show us that iOS owners are much more active than Android owners. Tuesday it is developing software to detect and remove a widespread computer virus that has infected an estimated 600,000 Macs and reminded Mac owners they are not immune to malware. Last week, the virus — dubbed “Flashback” or “Flashfake” — spread quickly around the world, downloading itself onto Macs and allowing hackers to gain remote access to victims’ computers. Earlier versions of the malware stemmed from a pop-up window that tricked users into installing a fake version of Adobe Flash. Newer versions exploited a security flaw in Java software that infected Macs by redirecting users to a bogus site. Once hackers gained control of the computers, they could spy on Mac users and steal their personal and banking data. Security experts have called Flashback the largest and most sophisticated attack on Macs to date. And many have criticized Apple for not patching the Java security flaw, which had been publicly identified in February. Apple also said Tuesday that it was working with Internet service providers worldwide to disable the computer servers hosted by the malware’s creators. Security firms Kaspersky Labs and Doctor Web have released tools so Mac users can check to see if their computers are infected by Flashback. The security firm F-Secure has written software to remove the malware. Experts say the Flashback virus should serve as a wake-up call to Mac users whose computers are often considered more secure than PCs running Microsoft Windows. A 2009 survey by the antivirus firm ESET found that more than half of Americans considered PCs to be “very” or “extremely” vulnerable to cyberattacks, but only 20 percent felt the same way about Macs. Some experts say Mac users have appeared immune to cybercrime because hackers have spent more time devising ways to hack Windows operating systems, which still run on the vast majority of PCs. 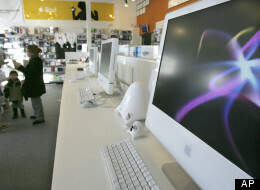 As Macs grow in market share, however, they will likely receive more attention from hackers, and Mac owners should be more vigilant about keeping their computers secure by installing antivirus software and keeping their software updated, according to Alan Woodward, a visiting professor at the University of Surrey’s department of computing. “Those using Mac OS have, perhaps, been lulled into a false sense of security,” Woodward wrote in a post on a blog hosted by the security firm Sophos. The Flashback virus is not the first time Macs have been targeted by hackers. Last May, between 60,000 and 125,000 Mac users were infected with the so-called Mac Defender malware, a phishing scam that tried to trick users into revealing their credit card information. And two weeks ago, security researchers found malware on older versions of Microsoft Office for Mac that was distributed by rogue emails appearing to target Tibetan activist organizations. The infected Microsoft Word documents allowed hackers to take control of Macs in order to download, upload and delete files, steal passwords and credit card numbers, or send spam. You’ve heard all about the new iPad that Apple announced yesterday, its new processor, beautiful Retina display, new camera and others. 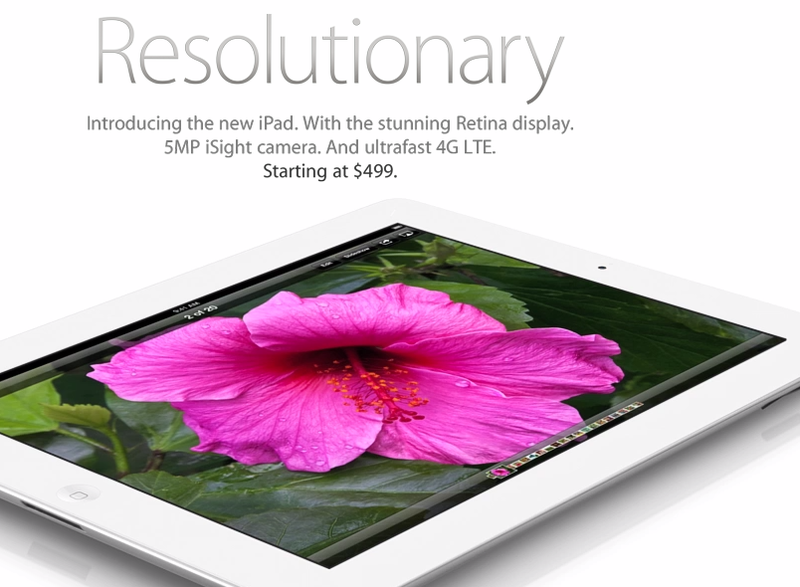 We also posted the complete keynote video for the event and the commercials for the new iPad. Now, it’s time for you to pre-order the new iPad! Previously, we mentioned about a survey that showed you that about 42 percent of current iPad or other tablet owners will want to get the new iPad. If you’re one of those and want to get yours right away, you can! Apple has put the new iPad up for pre-order on their online store, but the devices will be delivered to you on March 16 onwards. 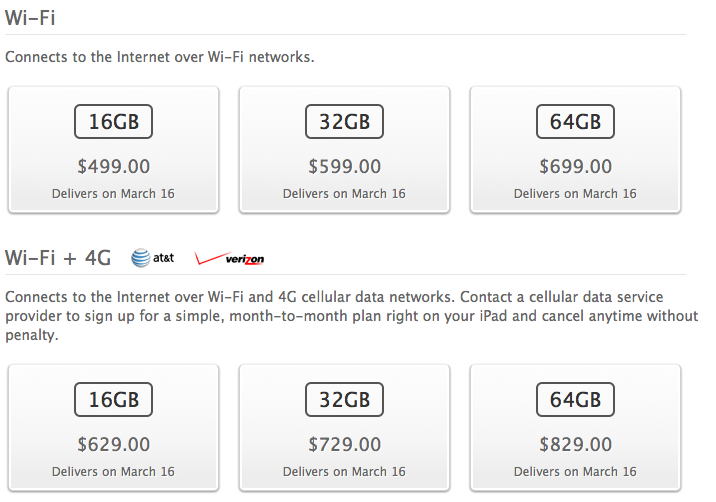 The Wi-Fi versions of the new iPad start from $499 onwards and the Wi-Fi+4G versions start from $629 onwards. If you’ve been saving up for the new iPad, then you should probably go pre-order it right away. The new iPad is much faster than the present iPad 2, has better graphics, a similar camera optics like the iPhone 4S, 4G LTE, beautiful Retina display and more! What are you waiting for? Pre-order the new iPad today by clicking here. 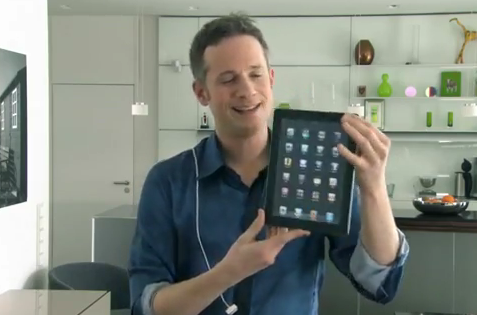 The only news that Apple fanboys are currently talking about, is the upcoming iPad 3. What will it have? Will it have the rumored A6 processor or maybe the A5x? Will Apple add a super high resolution Retina display to it? Will Siri be introduced? We have here an exclusive look at the new unreleased iPad 3, that shows its new Retina display, deep Siri integration, new iCloud features and a lot more that will blow you away. This is super exclusive, so have a good time and tell everyone how cool the not released iPad 3 is and the things that it can do. Have you just purchased a new gadget with an undersized keyboard? Would you like a quicker way to type on your gadget without having to carry around a physical keyboard? If so, it’s time to get a new wireless virtual keyboard for it! Thanks to Oztech Traders we can now get a reliable virtual keyboard dubbed Magic Cube. As you can see in the video above, it’s only a tiny little box, which could fit in your pocket that provides a virtual full-scale laser projection keyboard. It works by emitting an invisible infrared laser, in conjunction with an optical sensor, that recognizes and relays each keystroke as it is typed to your gadget. Today we broke news that hacker Planetbeing managed to get unsigned code running on the iPhone 4S. This is yet another step forward in the right direction for a public release of the iPhone 4S and iPad 2 Untethered Jailbreak. Now, hacker Pod2G has written a quick update on his blog sharing a video uploaded by hacker @DHowett, a member of Chronic-Dev, of a Jailbroken (Untethered) iPhone 4S running the iOS 5.0.1 firmware that you can watch below. If you watched the video above of DHowett’s Jailbroken iPhone 4S you will notice that everything seems to be working extremely well. He was able to reboot his iPhone 4S without a problem and browse through a special version of Cydia not yet released to the public. The reason someone like DHowett is able to Jailbreak his iPhone 4S is because he has an official Apple developer account and has the technical knowhow of how to correctly apply the unfinished A5 Untethered Jailbreak to his iPhone 4S. The public will not see a release of this unfinished A5 Untethered Jailbreak because Apple could patch the exploit used before a fully functioning version is ever released. Thus, we will just need to sit tight and wait a few more days (according to Pod2G) until the Untethered iPhone 4S and iPad 2 Jailbreak is released. Are you looking for a slick music streaming service that will allow you to listen to your favourite artists on your iPhone, iPod Touch, iPad, Android device and desktop computer for free? Introducing theGrooveShark music streaming service that supports all sorts of devices that have an Internet browser and support for HTML5 rendering. 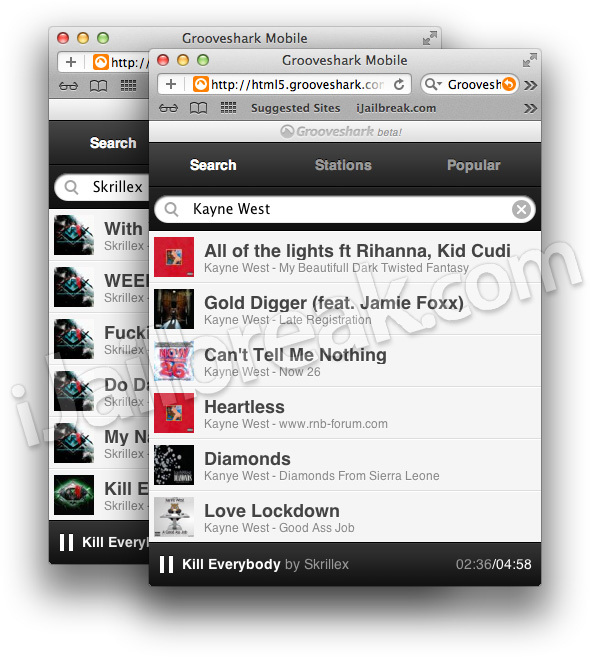 Many people may have seen GrooveShark off Cydia, GrooveShark is basically a music streaming service for iOS devices. After GrooveShark’s attempt to release an iPhone application in the official App Store, which got rejected by apple, they have decided to make a mobile HTML5 website for it that is worth checking out. With any rumours surfacing around the world wide web, you have to take them with a grain a salt, as they are simply different people or groups speculating for hype. This upcoming news is no different, just another rumour circling the internet. As we know Apple has a quite predictable product update schedule ranging from 10 to 14 months for most of their products. Keeping this in mind we can assume that the update to the very successful iPad 2, will be coming sometime in the first quarter of 2012. Focus Taiwan, a news channel publication has apparently obtained information from their Taiwanese makers in Apple’s supply chain, that many suppliers are being rushed in order to meet supply demand for the launch of the iPad 3 which will coincided with Steve Jobs’ birthdayanniversary, February 24th. After the iPhone 4S successfully took the tech market by storm, the iPad3 is widely expected to be Apple’s first hit product to be released next year. While this does make some sense, as Apple likes releasing products on Fridays, and the 24th definitely is a Friday, and it falls within the expected launch time. Apple has launched new products on his birthday anniversary before including the thunderbolt technology (sigh) and Safari 9. 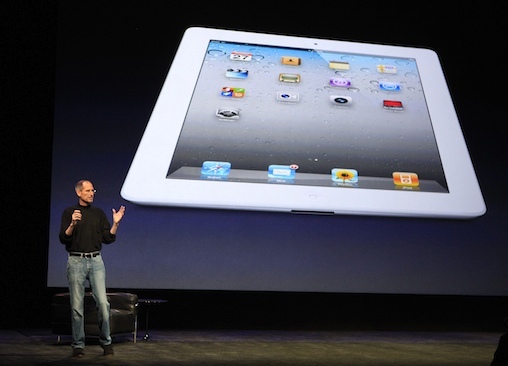 The original iPad was introduced back on January 27th 2010, and the iPad 2 was announced on March 2nd 2011. Much of the hype surrounding the update to Apple’s tablet has been referring to the changes that we can expect or hope to see in the new model. This includes increasing the processing power of the tablet to remain competitive with the new Tegra 3 processor, and increasing the screen resolution ofthe iPad. Apple’s new core, the A6, would also be a quad-core processor, allowing for much quicker applications, video rendering, and overall speed. The increase in the screen quality, was one of the features that many were missing in the iPad 2 update from the first-gen iPad, dubbed Retina Display. In addition to the hardware side, many believe that everyone’s favourite voice-assistant, Siri, will also come standard on the new iPad. These are a few of the more likely updates which also includes an upgrade of the rather pathetic cameras in the current iPad 2, but there are other suggestions including support for LTE, thicker, or thinner, and a different size of connector. With whatever upgrades we see, or we are let down with, the first quarter of 2012 looks to be the time that we can expect to see just what Steve Jobs had planned for the tablet update. 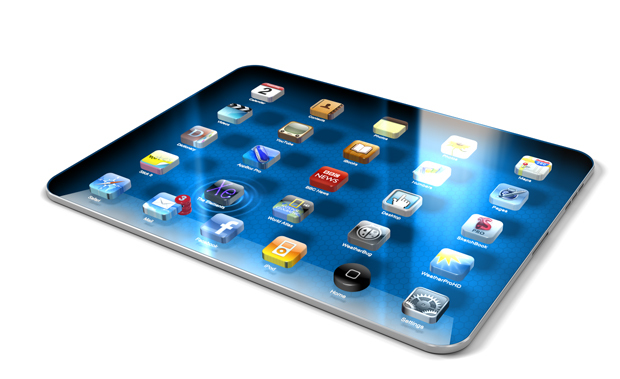 Are you waiting for the iPad 3? What feature would you like to see most in the update? Share them with us in the comments below. I personally would like to see that quad-core processor in it the most.